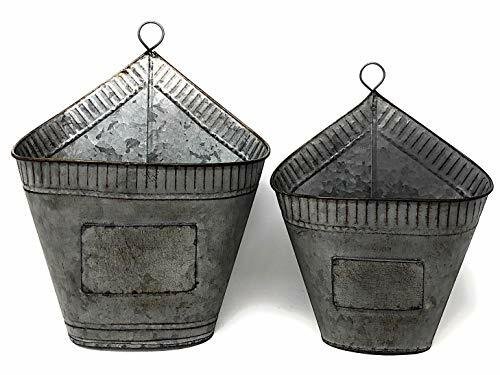 Set of 2 round shaped metal hanging wall planters organizer for home or office wall decor. Weatherproof and can be used indoor or outdoor. Vintage, classic, antique look great for hanging succulent, cactus, air plants, or decorative faux plants. Lightweight and easily mountable on any surface. WALL PLANTER ORGANIZER: Set of 2 Metal Galvanized Oval shape galvanized hanging wall planters for home or business decor (plants not included). RUSTIC WALL DECORATION: Rustic wall pocket, organizer for succulent, cactus, orchids, air plants or faux artificial plants for indoor or outdoor decorations. GARAGE SHOP ORGANIZER: The distressed finished tins vase can be used to organize mail, towels, papers, tools, garden equipment, knick - knacks and much more. METAL GALVANIZED: Vintage, classic, antique themed decor for wall or counter display in the kitchen, living room, den, garage, porch, bathroom, balcony, garden, patio, office, or cubicle. HANGING WALL POCKET: Large pocket is approximately 12" H x 9.5" W, smaller one 10" H x 7.5" W, lightweight with a loop at the top for easy hanging on any surface. Sturdy and stable to stand on their own. If you have any questions about this product by S.T.C., contact us by completing and submitting the form below. If you are looking for a specif part number, please include it with your message.